A school class had a day off visiting the beaches in the small village Collioure, not far from the Spanish border. 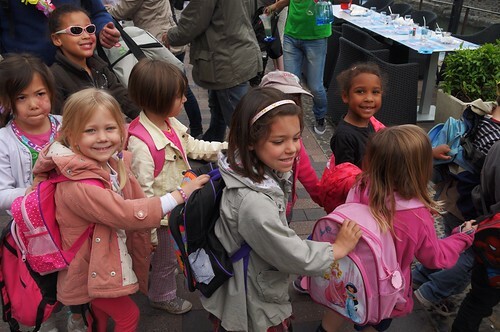 When going back to the bus through the crowded streets the small people in the class all kept a hand to the back of their friends in front of them - as you can see in this photo. They all walked in good spirit even having time to offer a smile to a bypassing photog. Schooling in France is mandatory as of age 6, the first year of primary school. Almost all the parents start sending their children earlier though, at age 3 as nursery classes (maternelle) are usually affiliated to a borough's primary school. Some even start earlier at age 2 in pré-maternelle or très petite section classes( which are essentially daycare centres), but they are a minority (11%). The last year of maternelle, grande section is an important step in the educational process as it is the year in which pupils are introduced to reading.